Cooperia oncophora is a species of parasitic nematode that infects cattle. Nematodes, also called roundworms, are worm-shaped animals. They are not the same as earthworms, which are segmented. Nematodes are non-segmented. There are 28,000 described species of nematode, most of them less than 1 cm in length. Many species are free-living and can be found in various environments: moss, rotting fruit, soil, the oceans. There are also 16,000 parasitic species. They can infect most mammals, birds, fish, reptiles, lizards and insects. Some species can infect plants. For more information check out wikipedia. 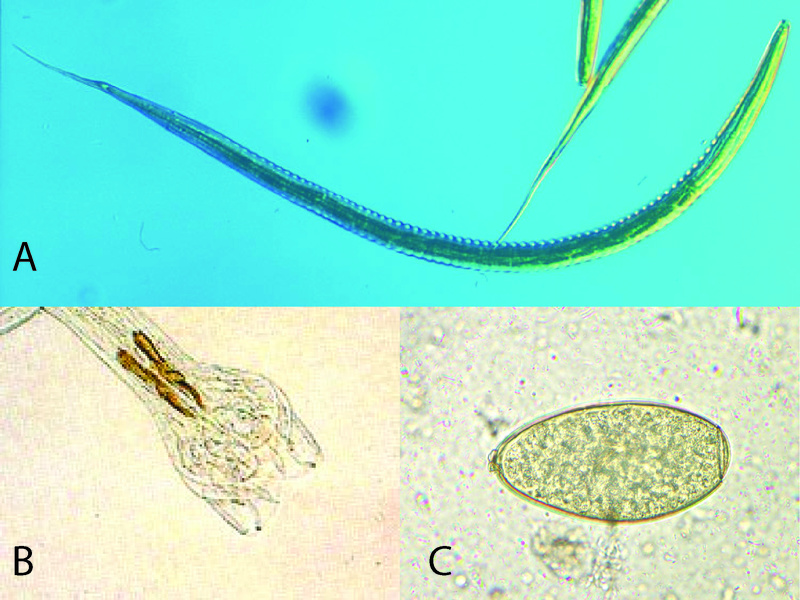 A – larvae, B – tail of adult male, C – egg. Sources: goo.gl/lPUf2W, goo.gl/9Q5NsL, goo.gl/Xr4zZY. Cooperia oncophora, like Ostertagia ostertagi is a roundworm of cattle. The immature worms, called larvae, live in the pastures and climb to the top of grass, where they are eaten by a grazing cow. Once in the cow’s intestines, they mature to adults. As adults they cling to the intestinal lining of the cow and feed of the tissue. The adults mate and the females produce thousands of eggs every day. These eggs leave the cow in the poo. Once out of the cow, the eggs hatch producing larvae and the cycle continues. While C. oncophora and O. ostertagi have very similar life cycles, C. oncophora is less pathogenic. This means that at equal worm burden, a cow will be more sick when infected with O. ostertagi than with C. oncophora. Both species are very common in cattle. What diseases does Ostertagia ostertagi cause? In winter and spring, calves can become infected with high numbers of adult worms. Cows calving for first time are also prone due to the stress of carrying an unborn calf. Pathology is characterised by large water loss, often profuse, watery diarrhea that is usually persistant. What is the treatment for Cooperia oncophora? A drug called Ivermectin is usually highly effective. It infers with the muscle function and nervous system of the worm – killing it.